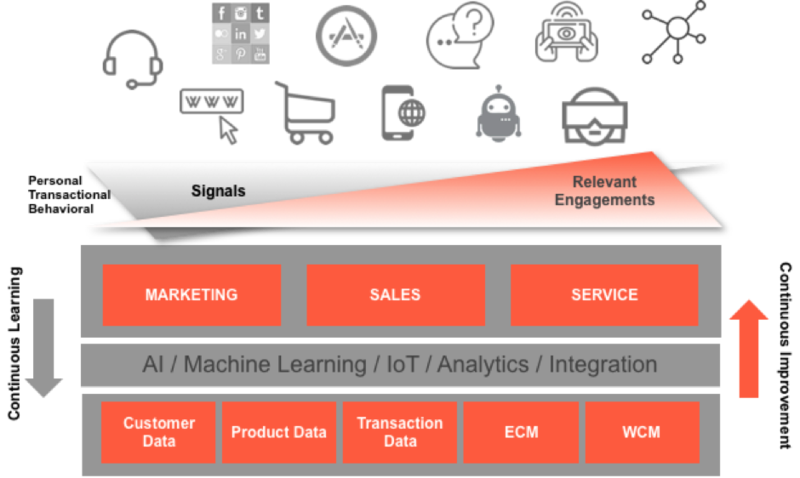 A lot has evolved since my Clash of the Titans post that looked into how the big 4.5 (Microsoft, Oracle, Salesforce, SAP, and Adobe) and others are positioning themselves in the greater CRM arena. First, the commoditization of the business application has accelerated and the vendors’ focus on the underlying platform has increased. CRM, and enterprise software in general, has always been a platform play although this has not always been recognized and sometimes even negated. The obvious reason for it being a platform play is that the creation of positive customer and user experiences need a consistent technical platform. Or else we are ending up in engagements that are fragmented across interactions. This results in inconsistent and poor experiences. A bit less obvious is the fact that there will be only few dominant platforms. Vendors, who want to become and stay successful on a grand scale need to be one of these few platform providers and attract partners and customers. This is the reason why I consult my customers that one of the very first IT strategy decisions that they need to take is the platform decision. As the article got a little longer this time and as I do not tend to write articles that are as long as dear friend Paull Greenberg’s (maybe I should consider to?) this revisit of the Clash of the Titans will become a two or three piece series, first covering the framework I want to use, the very definition of what I talk of when saying that CRM is a ‘platform play’. The subsequent articles then cover the big 4, thoughts about the big infrastructure providers, which are coincidently also 4, and maybe (yeah, it is not yet fully written) some words about one of the smaller and upcoming players. Of course all of the players that I mentioned above have their own definition of ‘platform’. So have other vendors that are tackling the SMB portion of the market rather than the saturated enterprise end of it. Most commonly, platform refers to both, infrastructure (IaaS) and functional, as well as development, (PaaS) platform. However, when talking about the (technical) platform I will concentrate more on the PaaS aspects although IaaS capabilities are crucial for every SaaS vendor; but then IaaS is a commodity in a multi cloud world, too. And we are not even in a pure cloud world, yet. Many organizations still choose to run essential applications in house. 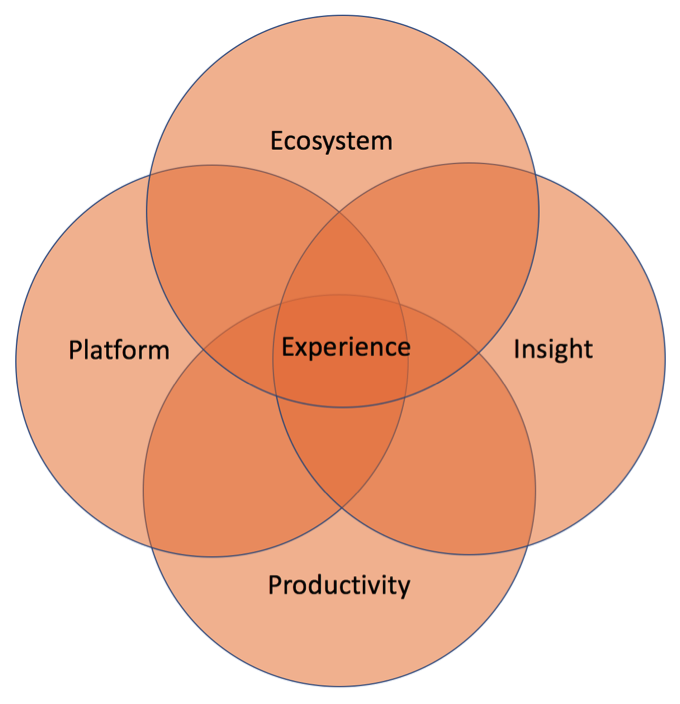 There is more to being able to create an experience than just a technical platform. Apart from an appropriate, customer oriented strategy and a culture to match, I mean. While the technical platform, in particular the development platform, is an important piece of the puzzle, it is not the only one. Probably not even the most important one. This platform holds and exposes the main capabilities that all enterprise software needs in order to be able to create a great experience: Analytics, integration, machine learning/AI, IoT services, blockchain, database access, security, to name just a few of the more important ones. The ability of organizations to innovate in fast cycles while maintaining a stable core is another one. 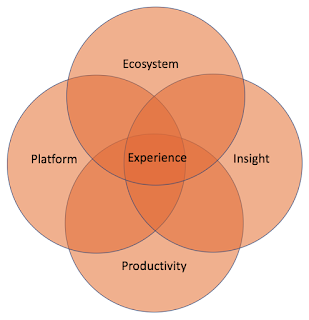 This platform is crucial for any customer experience architecture. So, why might there be something that is at least equally important? Because, apart from enabling the creation of own applications, the platform is only the foundation for scale. Being a platform player requires scale. This scale is achieved by building and nurturing an ecosystem of partners. These partners are developing more solutions; oher partners are implementing solutions across the ecosystem. To thrive, this ecosystem needs to be fair and transparent. Fair, in a sense that generated value is distributed in a way that distributes the value between the participants in a way that every partner feels treated fairly. This is very different from equal distribution. Transparent means that the ecosystem’s rules are clear, clearly understood and that adherence to them is visible for all parties. Not adhering to the rules leads to sanctions. A side condition is that the ecosystem must not be run on cost of the society that surrounds/embeds it. The vendor or provider of the ecosystem who participates in the transactions that are executed via the ecosystem. The third necessity for providing positive experiences is insight. Also not information. Information is data in a context. Information is needed to generate insight. Insight is actionable information with the objective of achieving an outcome. Insight is what enables companies or individuals to turn raw data into actions that yield positive results for customers and therefore for themselves. But there is a simple truth: Not enough data – no insight! Although data is only the raw material that enables rational decision making, there needs to be access to plenty of different types of data to be able to generate insight. This data may be structured or unstructured, transactional or behavioural, etc. Data may be first party, second party, or third party data. Through the use of analytics, data can be turned into information and through the use of advanced analytics and AI into insight. The services to enable this are delivered via the PaaS part of the platform. Effective and efficient process automation where possible, combined with an efficient way for people to get their jobs done. This is what productivity is about. Whatever the desired outcome, people need to be able to achieve it efficiently, with minimal friction, ideally their own way. Especially within a business, but also across businesses, people need to collaborate easily and efficiently. This requires a lot of tools, services, and a strong data sharing ability. It also requires people to interact with computers not in the computer way but the same way people interact. This is one of the main reasons for the rise of speech and voice interfaces. And efficient collaboration is not only necessary for people, but for interacting software systems as well; it is needed for an effective process automation. Hence the focus of the big software vendors – and not only theirs – in this quadruple play. But this is a topic for the next article, starting with the big 4. How do they stand, move, what are their strenghts and possibly their weaknesses.